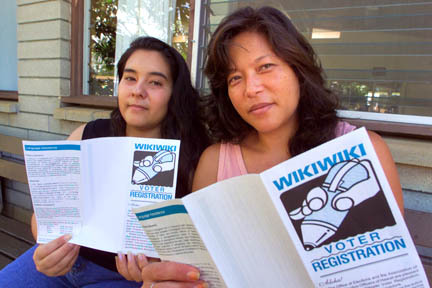 Flora Barros-Espana and Kimberly Smith examine Wikiwiki voter registration pamphlets at the Salvation Army shelter in Kaimuki. Their opportunity for election empowerment came from the group Partners in Care. Kimberly Smith is homeless, not powerless. And thanks to a new initiative by a Hawaii nonprofit, the 39-year-old said she will exercise her right to vote for the first time this election year. "In the past I always told myself I wouldn't make a difference," Smith said recently, fresh from filling out a voter registration form. "But I might make a difference." Partners in Care, a group that addresses issues affecting the state's homeless, started its first-ever homeless voter registration drive earlier this year. Their lone registrar has been hitting Hawaii's shelters and community health centers since, and she has already registered more than 30 homeless voters. The program is the first of its kind in the state, and one of very few in the nation. Organizers say they are hoping that homeless residents brought into the voting process will feel empowered and important. Rebecca Anderson, who helped kick-start the drive, knows Hawaii's homeless probably will not determine a candidate's chances of being elected. But the aim of the project is not to produce a voter bloc. "A lot of people who are homeless feel pretty disenfranchised," she said. "I think my main goal is to let people know that they're eligible to register and they can participate in politics." Registrar Cecile Smith, who is a volunteer, said it is a misconception that citizens need an address to vote, and the homeless could put the park they live in on a registration form and be accepted. Smith was at the Kaimuki women's shelter on 22nd Avenue Friday morning, registering a group of four -- all of whom will be first-time voters on election day. Before passing out registration forms to the women, Smith talked about the power of one -- homeless or not. "We're just trying to reach out to them and go to them so that they have a sense that they're a citizen and they belong," Smith said after the sign-up. "I try to talk to them about the responsibility and the effect that they can have." Flora Barros-Espana, 26, said she intends to vote for a candidate who pledges to pay more attention to the homeless. She said she wants more programs for women on the streets, and better aid for mothers without jobs. "I like find somebody," she said, "who's actually going to help us (the homeless)." Claire Woods, executive director of the Salvation Army shelter, said she is excited about the homeless-voter drive and hopes the number of registrants continue to climb. The Kaimuki home is for women with young children who are former drug addicts, and Wood said getting her boarders to vote tells them that they "do have choices in this world." "One of our core values is empowerment," she said. "That's really the role of voting. They are contributing to our community." Both Smith and Anderson said the biggest hurdle for the program will be getting the homeless to the polls on election day. Smith said the nonprofit is asking for help from shelters and might rent buses to shuttle voters. "We will have to provide something to some of the people," she said. Meanwhile, Smith continues to get calls from agencies interested in the drive. She is scheduled to go to the Salvation Army's drug rehabilitation clinic on Waokanaka Street today, where more than 60 people are expected to sign up to vote, and the Safe Haven shelter in Honolulu later this month. "The people are delighted," Smith said. "A lot of it has to do with taking control of your life ... and making them realize that they count, they're important and that they're needed."